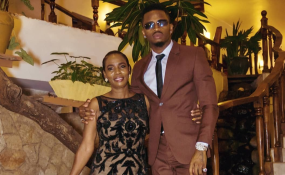 Tanzanian bongo artist, Diamond Platnumz with his mother Sandra Dangote. The mother of Tanzanian bongo artiste, Diamond Platnumz, has lashed out at a pastor with homophobic slur over allegations that she has neglected her ailing ex-husband. The conversation reportedly happened when the pastor reached out to Bi Sandra with an aim of acting as a mediator between her and her former husband, Mzee Abdul Juma. Mzee Juma, who is Diamond's biological father, has for a while now been begging his son to offer him financial assistance to cater for his medical bills. In the audio, Diamond's mother lashes out at Pastor Mashimo with homophobic slurs, accusing him of seeking fame through her family. Bi Sandra: (Answering the phone) Hello, nani? Mchungaji? Pastor Mashimo: Amina za kwako. Pastor Mashimo: Sasa mama Diamond mimi ni mtumishi wa Mungu tujiheshimu. Bi Sandra: Mbwa mkubwa wewe kwenda kabisa! In recent weeks, Pastor Mashimo has been conducting interviews claiming that he has been sent by God to rescue Diamond's family. The pastor is also on record for alleging that Bi Sandra is the reason Diamond isn't helping his father. According to Tanzanian media reports, the old man, who abandoned Diamond and his mother many years ago, suffers from skin cancer and despite his son and ex-wife's opulent lifestyle, they have chosen to ignore his pleas for help.